Noctilucent clouds (NLCs) turn on every year in late spring, reaching almost full intensity over a period of no more than 5 to 10 days. These electric-blue ice clouds hang 85 km (53 miles ) above Earth's surface, at the edge of space itself, circling the north and south pole regions. Breaking through the barriers of high-latitude that once kept them bottled up in the Arctic, NLCs have been sighted as far south as Colorado, Virginia, Kansas, and Utah. Here are some examples of sightings in the lower United States. 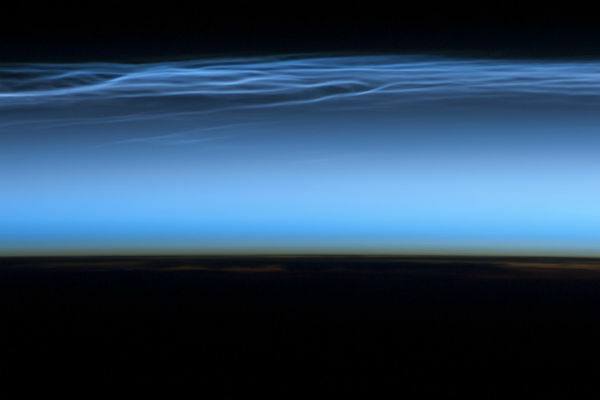 The origin of noctilucent clouds is still largely a mystery. Some suggest meteoric dust, rocket exhaust, global warming and other. Night clouds or noctilucent clouds are tenuous cloud-like phenomena that are the "ragged-edge" of a much brighter and pervasive polar cloud layer called polar mesospheric clouds in the upper atmosphere, visible in a deep twilight. They are made of crystals of water ice. Polar mesospheric clouds form between 76 to 85 kilometers (47 to 53 miles) above Earth’s surface when there is sufficient water vapor at these high altitudes to freeze into ice crystals. The clouds are illuminated by the Sun when it is just below the visible horizon, lending them their night-shining properties. In both the Northern and Southern Hemisphere, during their respective late spring and early summer seasons, polar mesospheric clouds are at the peak of their visibility. Visible from aircraft in flight, the International Space Station (ISS), and from the ground at twilight, the clouds typically appear as delicate, shining threads against the darkness of space—hence their other names of “noctilucent” or “night-shining” clouds. Noctilucent clouds are not fully understood and are a recently discovered meteorological phenomenon; there is no record of their observation before 1885. Noctilucent clouds can form only under very restrictive conditions; their occurrence can be used as a sensitive guide to changes in the upper atmosphere. They are a relatively recent classification. The occurrence of noctilucent clouds appears to be increasing in frequency, brightness and extent. It is theorized that this increase is connected to climate change. Some climate models predict that increased greenhouse gas emissions cause a cooling of the mesosphere, which would lead to more frequent and widespread occurrences of noctilucent clouds. A competing theory is that larger methane emissions from intensive farming activities produce more water vapour in the upper atmosphere. Methane concentrations have more than doubled in the past 100 years. How to spot nocticulent clouds? 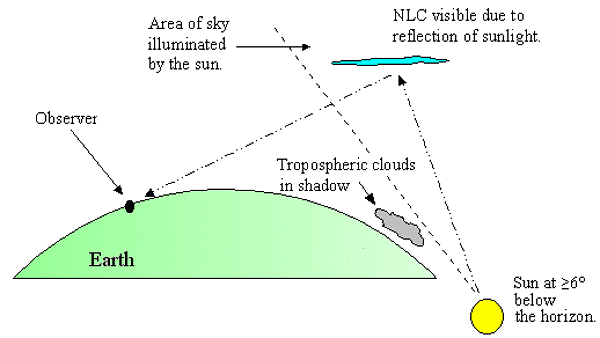 NLCs favor high latitudes during the summer months. Look west 30 to 60 minutes after sunset when the Sun has dipped 6o to 16 below the horizon. NCLs should look like luminous blue-white tendrils spreading across the sky. They can be skein-like, rich with undulations, currugations, knots and streaks clawing upwards into the sky, at other times they lie close to the horizon as a featureless band. They are never visible in daylight. Wait until an hour after sunset when twilight has deepened. The sun should be o6 - 16° below the horizon, enough to darken the sky but not so low that the NLCs are not still in sunlight. Search first of all low in the sky towards the direction of the sun beneath the horizon, northwest before midnight, northeast afterwards. Avoid moonlit nights when lower clouds and especially cirrus are lit white against a darker sky.